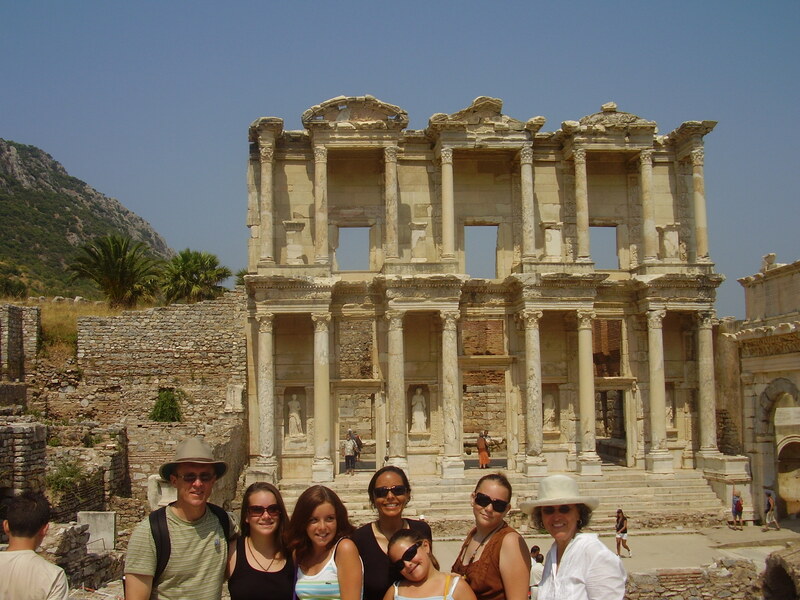 Use the form below to contact tour Daily Ephesus Tour by Plane from Istanbul directly. 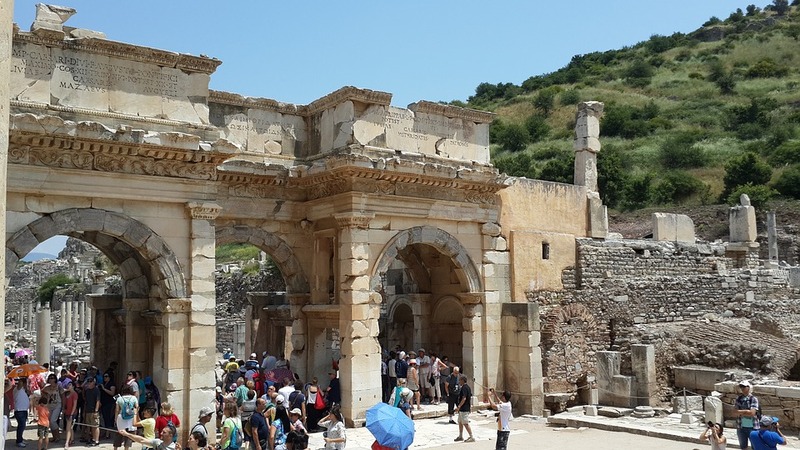 This is a daytrip to Ephesus from Istanbul by plane returning back on the same day. We organise the tours as private or in small number of groups upon the date & requests. We have flexibility in our tours. If you have any questions; please send us your suggestions by E-Mail. Here you can see the itinerary. 05:30 AM : Pickup service from your hotel with a private minivan and transfer to Atatur Airport. 09:15 AM : Meeting with the Guide ans start the Full Day Tour. visit the world famous ancient Greco-Roman City of Ephesus, the most well preserved example in the world. Mary, where it is believed she spent her last days. This is a holy place for both Christians and Muslims. Note : Upon request; we can organise the trip by bus ( 10 Hours ) and can include acomodation. Early Reservation is Required !!! This is a private or a group tour runs all year long. Domestic flight tickets. Istanbul / Izmir / Istanbul). According to tradition, Efes (Ephesus), one of the most important cities of antiquity, was founded by Androclos, although it has been established that the Lelegians and Carians inhabited the place earlier. The city must have been colonized no later than the 10th century B.C., by the lonians. Then Persian invasion in the 6th century B.C. took place. As you can see Ephesus History goes way back. This was followed by Ionian uprising against the Persians during the 5th century B.C. The ruins remaining are of the city established by Lyssimachos, one of the generals of Alexander the Great in the 3rd century B.C. The best remains of the city ramparts today are from this era. During its Golden Age (2nd century B.C. ), the city had a population of around 300,000; it monopolized the wealth of the Middle East and was one of the principal ports of the Mediterranean. Finally, the Roman and Byzantine Empires took control of the city. When the Seljuks and later Ottomans claimed the control of the city, it had already lost its commercial and political significance. 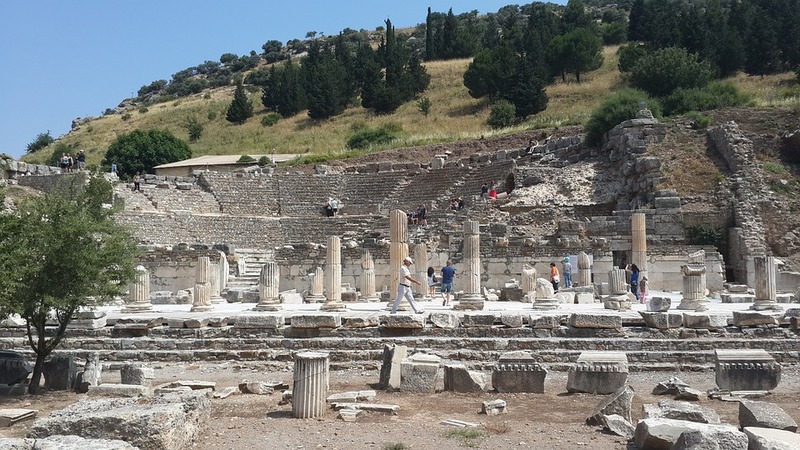 Today, a visit to Ephesus is one of the highlights of any visit to Turkey. 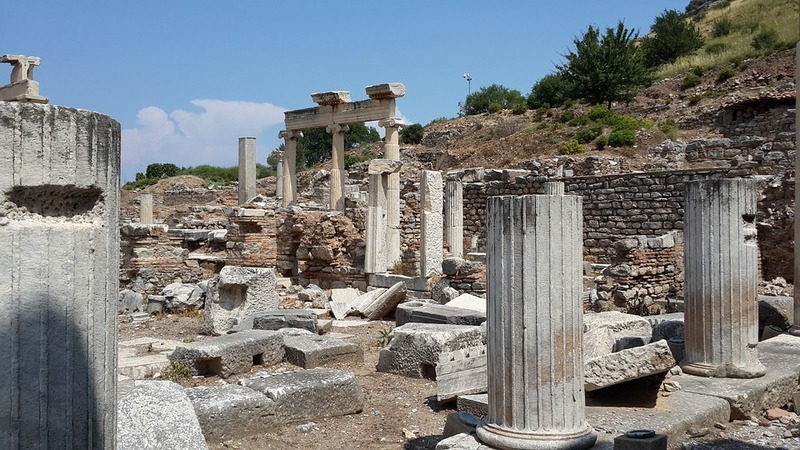 Visits to the ruins of Efes usually begin in the eastern part of the city through the Magnesia Gate, around the important Upper Agora or also known as the State Agora. The Eastern Gymnasium is located just next to the Magnesia Gate on the Pion mountain side. Clustered around the State Agora were the Varius Baths and the Odeion, both from the 2nd century A.D., the Prythaneion or Town Hall, and the Temple of Domitian – the first temple of Efes to be built in the name of an emperor (81 – 96A.D.) – located next to the Domitian Square. The Temple of Dea Roma was located right next to the Odeion. Leading westwards from the Upper Agora is the famous Curettes Street. Of particular interest on the eastern part of the street are the Pollio(4th century A.D.) and Traian (2nd century A.D.) Fountains, the Memmius Monument (1st. century A.D.), the elegant facade of the Temple of Hadrianus, the Skolasticia Baths (2nd cent. A.D.), and the Heracles Gate. Set on the hillside above the street are the restored Terraced Houses, containing interesting, often well preserved frescoes from the 2nd century A.D.
At the start of the Marble Street (built by Nero, 54-68 A.D.) is the Lower Agora. Just to the left as one approaches the agora, is the Celsus Library (2nd century A.D.) with its very elaborate facade, which has been restored. The Gate of Mazaeus and Mithridates has been restored and is the most beautiful entrance to the Agora. One of the most interesting buildings in Ephesus, the Serapis Temple, is located right to the west of the Agora. St. Paul gave sermons in the Grand Theatre, seating 25,000 – the most spectacular monument of Efes. The Theatre beautifully restored and now serves as a setting for the artistic and folkloric shows of the international Efes Festival, held every year in spring. The Theatre Gymnasium, opposite, built in the 2nd century A.D., also contained a bath-house. The Arcadian Way was the long main road, paved with marble and lined with columns on both sides, that stretched from the Grand Theatre to the old port, now totally silted. On this road was the Four Evangelists Monument – four columns upon which stood statues of the four evangelists. The marvelous Hellenistic Fountain stood just across the Theater and next to the eastern end of the Arcadian Way. I love Ephesus History. The Vedius Gymnasium was located to the north end of the city, right next to the Byzantine era city ramparts. The oval shaped stadium was built during the time of Emperor Neron and located to the south of the Vedius Gymnasium. There was also a love house behind the Hadrianus Temple. Down by the ancient harbour is the Harbour Gymnasium and Baths. These were constructed near the quay in order to receive with hospitality dignitaries who arrived from the sea. The Church of the Holy Virgin Mary was constructed in the 2nd and 3rd centuries, and it played an important role in the early expansion of Christianity; this church symbolized one of seven Churches of the Apocalypse. The cave of the Seven Sleepers is reached through the asphalt road which goes through the east of the Vedius Gymnasium. Nearby is the House of the Virgin Mary. According to tradition, St. John brought Mary to Efes after the death of Christ. A small house was built for her on Bulbuldagi (Mt. Nightingale) where she spent the last days of her life. Officially sanctioned by the Vatican, it is now popular site of pilgrimage, visited by Christians and Muslims from all over the world. A commemoration ceremony is held here every year on the 15th of August. 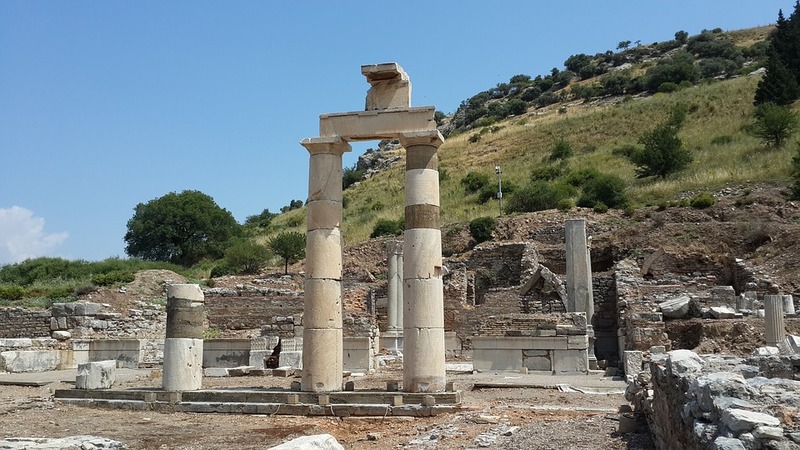 On the road from Efes to Selcuk is the ruin of the Temple of Artemis. Once numbered amongst the Seven Wonders of the ancient world, it was constructed entirely of marble. 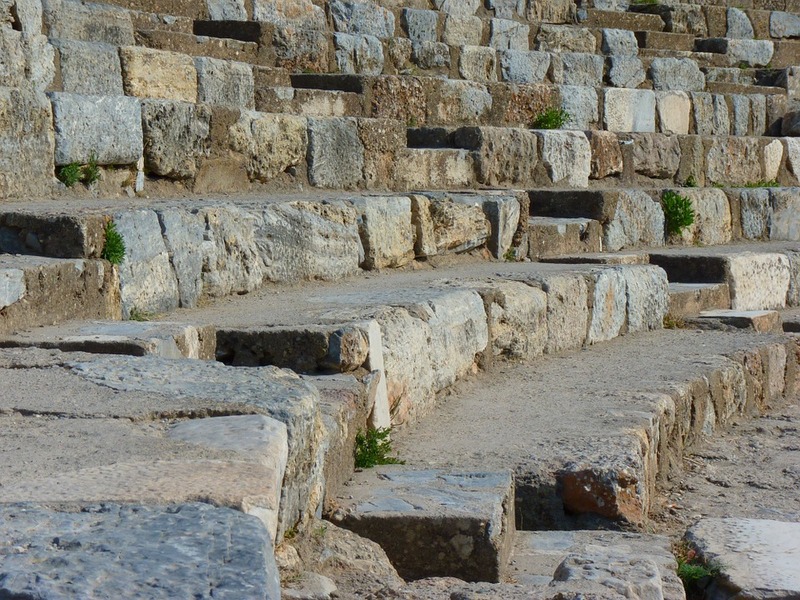 The marble road which was connecting the Temple of Artemis to the State Agora through the Magnesia Gate was considered to be the holy road of the city. The town of Selcuk is dominated by a Byzantine citadel overlooking the Basilica of St.John (presently under restoration). The present structure was built by the Emperor Justinian in the 6th century A.D. St.John lived on this hilltop and was buried here. Next to the Basilica is the Isa Bey Mosque with its typical Seljuk-style portal. It is one of the finest major works representing Seljuk art. The first excavations of the ancient city of Ephesus was started in the late 19th century. The Efes Archaeological Museum in Selcuk has been enlarged and displays now the impressive works of art recovered from and around Efes. 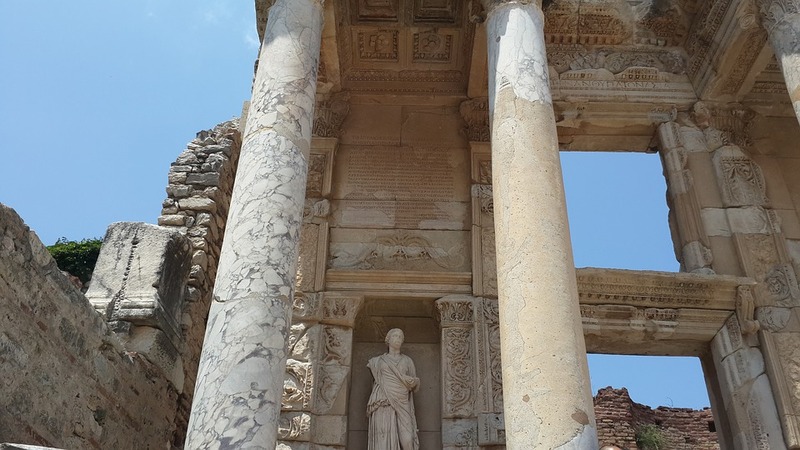 Ephesus was founded as an Attic-Ionian colony in the 10th century BCE on the Ayasuluk Hill, three kilometers from the center of antique Ephesus (as attested by excavations at the Seljuk castle during the 1990s). The mythical founder of the city was a prince of Athens named Androklos, who had to leave his country after the death of his father, King Kadros. According to legend, he founded Ephesus on the place where the oracle of Delphi became reality (“A fish and a boar will show you the way”). Androklos drove away most of the native Carian and Lelegian inhabitants of the city and united his people with the remainder. He was a successful warrior, and as king he was able to join the twelve cities of Ionia together into the Ionian League. During his reign the city began to prosper. He died in a battle against the Carians when he came to the aid of Priene, another city of the Ionian League. Androklos and his dog are depicted on the Hadrian temple frieze, dating from the second century. Later, Greek historians such as Pausanias, Strabo and the poet Kallinos, and the historian Herodotos reassigned the city’s mythological foundation to Ephos, queen of the Amazons. The Greek goddess Artemis and the great Anatolian goddess Kybele were identified together as Artemis of Ephesus. The many-breasted “Lady of Ephesus”, identified with Artemis, was venerated in the Temple of Artemis, one of the Seven Wonders of the World and the largest building of the ancient world according to Pausanias (4.31.8). Pausanius mentions that the temple was built by Ephesus, son of the river god Caystrus before the arrival of the Ionians. Of this structure, scarcely a trace remains. About 560 BCE Ephesus was conquered by the Lydians under king Croesus. He treated the inhabitants with respect, despite ruling harshly, and even became the main contributor to the reconstruction of the temple of Artemis His signature has been found on the base of one of the columns of the temple (now on display in the British Museum). Croesus made the populations of the different settlements around Ephesus regroup (synoikismos) in the vicinity of the Temple of Artemis, enlarging the city. Ephesus continued to prosper. But when taxes continued to be raised under Cambyses II and Darius, the Ephesians participated in the Ionian Revolt against Persian rule in the Battle of Ephesus (498 BCE), an event which instigated the Greco-Persian wars. In 479 BCE, the Ionians, together with Athens and Sparta, were able to oust the Persians from Anatolia. In 478 BCE, the Ionian cities entered with Athens and Sparta into the Delian League against the Persians. Ephesus did not contribute ships but gave financial support by offering the treasure of Apollo to the goddess Athena, protectress of Athens. These wars did not much affect daily life in Ephesus. The Ephesians were surprisingly modern in their social relations. They allowed strangers to integrate. Education was much valued. Through the cult of Artemis, the city also became a bastion of women’s rights. Ephesus even had female artists. In later times, Pliny the Elder mentioned having seen at Ephesus a representation of the goddess Diana by Timarata, the daughter of a painter. When Alexander the Great defeated the Persian forces at the Battle of Granicus in 334 BCE, the Greek cities of Asia Minor were liberated. The pro-Persian tyrant Syrpax and his family were stoned to death, and Alexander was greeted warmly when he entered Ephesus in triumph. When Alexander saw that the temple of Artemis was not yet finished, he proposed to finance it and have his name inscribed on the front. But the inhabitants of Ephesus demurred, claiming that it was not fitting for one god to build a temple to another. After Alexander’s death in 323 BCE, Ephesus in 290 BCE came under the rule of one of Alexander’s generals, Lysimachus. As the river Cayster silted up the harbor, the resulting marshes caused malaria and many deaths among the inhabitants. The people of Ephesus were forced to move to a new settlement two kilometers further on, when the king flooded the old city by blocking the sewers. This settlement was called after the king’s second wife, Arsinoe II of Egypt. After Lysimachus had destroyed the nearby cities of Lebedos and Colophon in 292 BCE, he relocated their inhabitants to the new city. Ephesus revolted after the treacherous death of Agathocles, giving the Syrian king Seleucus I Nicator an opportunity for removing and killing Lysimachus, his last rival, at the Battle of Corupedium in 281 BCE. After the death of Lysimachos the town again was named Ephesus. Thus Ephesus became part of the Seleucid Empire. After the murder of king Antiochus II Theos and his Egyptian wife, pharaoh Ptolemy III invaded the Seleucid Empire and the Egyptian fleet swept the coast of Asia Minor. Ephesus came under Egyptian rule between 263-197 BCE. When the Seleucid king Antiochus III the Great tried to regain the Greek cities of Asia Minor, he came in conflict with Rome. After a series of battles, he was defeated by Scipio Asiaticus at the Battle of Magnesia in 190 BCE. As a result, Ephesus came under the rule of the Attalid king of Pergamon Eumenes II (197-133 BCE). When his grandson Attalus III died without male children of his own, he left his kingdom to the Roman Republic. Ephesus became subject of the Roman Republic. The city felt at once the Roman influence. Taxes rose considerably, and the treasures of the city were systematically plundered. In 88 BCE Ephesus welcomed Archelaus, a general of Mithridates the Great, king of Pontus, when he conquered western Anatolia. This led to the Asiatic Vespers, the slaughter of 80,000 Roman citizens in Asia Minor, or any person who spoke with a Latin accent. Many had lived in Ephesus. But when they saw how badly the people of Chios had been treated by Zenobius, a general of Mithridates, they refused entry to his army. Zenobius was invited into the city to visit Philopoemen (the father of Monima, the favorite wife of Mithridates) and the overseer of Ephesus. As the people expected nothing good of him, they threw him into prison and murdered him. Mithridates took revenge and inflicted terrible punishments. However, the Greek cities were given freedom and several substantial rights. Ephesus became, for a short time, self-governing. When Mithridates was defeated in the First Mithridatic War by the Roman consul Lucius Cornelius Sulla, Ephesus came back under Roman rule in 86 BCE. Sulla imposed a huge indemnity, along with five years of back taxes, which left Asian cities heavily in debt for a long time to come. The city and temple were destroyed by the Goths in 263. This marked the decline of the city’s splendor. The importance of the city as a commercial center declined as the harbor was slowly silted up by the river (today, Küçük Menderes) despite repeated dredging during the city’s history. (Today, the harbor is 5 kilometers inland). The loss of its harbor caused Ephesus to lose its access to the Aegean Sea, which was important for trade. People started leaving the lowland of the city for the surrounding hills. The ruins of the temples were used as building blocks for new homes. Marble sculptures were ground to powder to make lime for plaster. Anatolia was associated with John one of the chief apostles, and the Gospel of John might have been written in Ephesus, c 90-100. Ephesus was one of the seven cities addressed in Revelation (2:1–7), indicating that the church at Ephesus was still strong. Two decades later, the church at Ephesus there was still important enough to be addressed by a letter written by Bishop Ignatius of Antioch to the Ephesians in the early 2nd century AD, that begins with, “Ignatius, who is also called Theophorus, to the Church which is at Ephesus, in Asia, deservedly most happy, being blessed in the greatness and fullness of God the Father, and predestinated before the beginning of time, that it should be always for an enduring and unchangeable glory” (Letter to the Ephesians). The church at Ephesus had given their support for Ignatius, who was taken to Rome for execution. Ephesus contains the largest collection of Roman ruins in the eastern Mediterranean. Only an estimated 15% has been excavated. The ruins that are visible give some idea of the city’s original splendor, and the names associated with the ruins are evocative of its former life. The theater dominates the view down Harbour Street, which leads to the silted-up harbor. The Library of Celsus, the façade of which has been carefully reconstructed from all original pieces, was built ca. CE 125 by Gaius Julius Aquila in memory of his father and once held nearly 12,000 scrolls. Designed with an exaggerated entrance — so as to enhance its perceived size, speculate many historians — the building faces east so that the reading rooms could make best use of the morning light. A part of the site, Basilica of St. John, was built in the 6th century CE, under emperor Justinian I over the supposed site of the apostle’s tomb. It is now surrounded by Selçuk. The Odeon was a small roofed theate constructed by Vedius Antonius and his wife around 150 CE. It was a small salon for plays and concerts, seating about 1,500 people. There were 22 stairs in the theater. The upper part of the theater was decorated with red granite pillars in the Corinthian style. The entrances were at both sides of the stage and reached by a few steps. 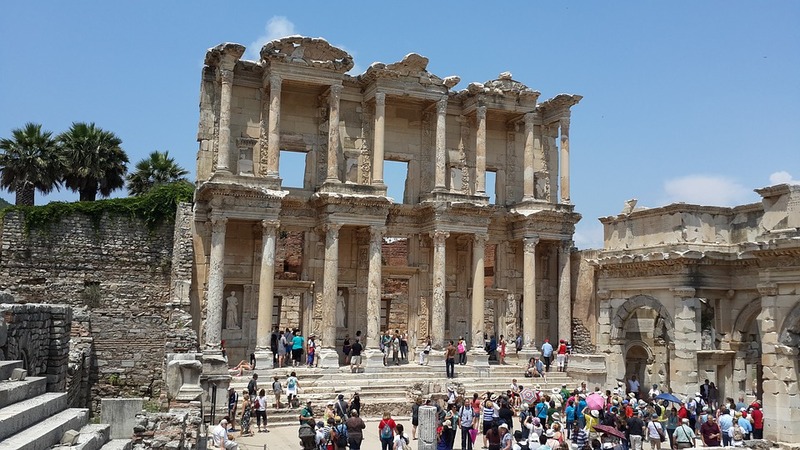 The history of archaeological research in Ephesus stretches back to 1863, when British architect John Turtle Wood, sponsored by the British Museum, began to search for the Artemision. In 1869 he discovered the pavement of the temple, but since further expected discoveries were not made the excavations stopped in 1874. In 1895 German archaeologist Otto Benndorf, financed by a 10,000 guilder donation made by Austrian Karl Mautner Ritter von Markhof, resumed excavations. In 1898 Benndorf founded the Austrian Archaeological Institute which plays a leading role in Ephesus today.